le diamant : un patrimoine qui tient dans la poche ! The Pink Star, the world's largest cut diamond of its class, sold at Sotheby's evening auction in Geneva for a record $82 million, Sky News reports. That's well above the estimated $60 million sale price, and does not include Sotheby's commission, according to AFP. The 59.6-carat diamond was expected to command a record price, both because of its size and color. It is the largest internally flawless or flawless, fancy vivid pink diamond that the Gemological Institute of American (GIA) has ever graded, according to Sotheby's. As for its uniquely vivid hue, The Telegraph explained: "The 'Pink Star' gets its intense pink colour due to changes to the electron structure, known as 'plastic deformation' during its journey to the earth's surface." The previous record price for a diamond was $46.2 million. 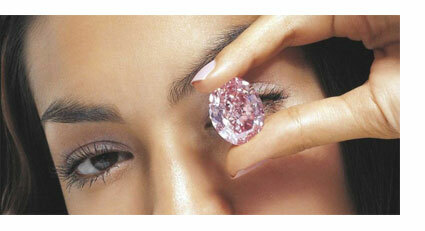 That diamond, also a pink stone, was purchased by London jeweler Lawrence Graff at a 2010 Sotheby's auction. Here's another look at the Pink Star. The identity of the buyer remains under wraps. "The Orange," the largest fancy vivid orange diamond in the world. The VS1 clarity pear-shaped diamond of 14.82 carats was estimated at $17 million to $20 million in a Geneva auction. It sold for 32.6 million Swiss francs, or about $36 million, a record for an orange diamond. Source: 2013 Christie's Images Ltd. via Bloomberg The largest fancy vivid orange diamond known to exist sold for 32.6 million Swiss francs ($36 million) in a Swiss auction by Christie’s International. The presale estimate on the 14.82-carat pear-shaped gem in Geneva was as much as $20 million, or $1.3 million per carat, the auction house said. The largest orange diamond to appear in auction to date was less than 6 carats. The Geneva fall auction season culminates tomorrow when Sotheby’s (BID) auctions a 59.60-carat internally flawless diamond called the “Pink Star.” It’s valued at more than $60 million, and David Bennett, who will wield the gavel, may break his 2010 record for the most expensive diamond sold in auction if it finds a buyer. “There are buyers out there for these great rarities,” Bennett said in an interview Nov. 8. “There are moments to offer these things and there are moments when it just doesn’t feel right. This does feel like one of the right moments.” While pink and blue diamonds regularly appear at auctions, the orange stones are much rarer. The last time an orange diamond of the same classifications appeared at auction, it weighed 5.54 carats. Known as “The Pumpkin Diamond,” it fetched $1.3 million at Sotheby’s in 1997, selling to Ronald Winston, a son of the Harry Winston founder. Christie’s diamond has been with the same anonymous owner for at least 30 years, the auction house said, describing its clarity as VS1. “As far as orange diamonds go, it has no peer,” Alan Bronstein, a consultant in colored diamonds who knows the stone said before the sale. “It’s unpredictable what a diamond like that can go for. We are entering uncharted waters. ”The most expensive diamond at auction fetched 45.4 million francs at Sotheby’s in Geneva in 2010; the fancy, intense pink stone weighed 24.78 carats and was snapped up by jeweler Laurence Graff. Christie’s also sold a Van Cleef & Arpels Art Deco emerald-and-diamond necklace that belonged to Egyptian Princess Faiza for 3.9 million francs. The auction house called it a “very rare souvenir of pre-revolutionary Egypt in the late 1940s.” A 1926 Cartier necklace with more than 108 carats of emeralds and 59 carats of diamonds commanded 9.1 million francs at Christie’s. It was part of a collection by Bolivian tin tycoon Simon Itturi Patino, known as “The Andean Rockefeller.” A 1957 Patek Philippe pink-gold watch that adjusts for leap years and is one of six of its kind known to exist sold for $2.2 million at Christie’s yesterday as the auction house sold a record $43.9 million of watches within 24 hours. The sale also included a 1969 Rolex that sold for $1.1 million, a record for the Daytona model and close to a record for that brand. Muse highlights include Mark Beech on music, Frederik Balfour on Asian art, James Russell on architecture and Amanda Gordon ’s Scene Last Night. FROM the air, a sight that evokes Tolkien's Middle Earth looms out of the scrub - a vast gouge in the earth, striated with yellow and grey rock. This is Ellendale Diamond Mine in the remote reaches of the Kimberley in northwest Australia, and arriving there is a bit like landing on another planet - but one fit for giants rather than dwarfs. On the ground, though, among the mud and muddle of a mine site, we find an atmosphere that seduces-a friendly and excited "family" that is building a life around bringing the sunshine back to the yellow diamond business. Times have been rocky in the diamond industry since the global financial crisis, but a new executive team from South Africa has crossed the Indian Ocean to be part of a new vision for Ellendale, one that sees it as a unique platform to satisfy the quickening thirst for high-calibre yellow diamonds in China and India. Tiffany's Ellendale mine in the Kimberley strikes yellow diamond gold! This relatively small Kimberley open-cut mine - a fraction of the size of Argyle to the east - has a special claim to fame. While Argyle produces the supremely rare pink diamonds, the vast bulk of its production is of low-grade industrial-quality diamonds. Ellendale, by contrast, is the world's leading producer of fancy yellow diamonds-accounting for 50 per cent of global supply - which explains why in 2010 the world's leading jeweller Tiffany & Co negotiated exclusive rights to them for the full economic life of the mine. This is the glamour end of Australia's mining boom. 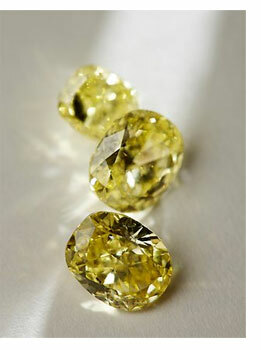 Only one in 10,000 of all diamonds are yellow, and less than 1 per cent of these radiate the inner fire that makes them "fancy" - their rarity commanding prices two or three times that of a white diamond. The best diamonds that come out of Ellendale have a wonderful buttery sheen and are so beautiful as they come out of the ground- uncut and unpolished - that you can almost see the jewel in your hand. While only 12 per cent of Ellendale's stones are radiant and charismatic enough to meet Tiffany's exacting standards, they account for about 80 per cent of the mine's total revenue. Always prized by connoisseurs, yellow diamonds have recently surged in popularity among the style-conscious, in keeping with the fashion for all brightly coloured gems; celebrities Heidi Klum and Jennifer Lopez have recently sported yellow diamond rings and Rihanna has sung of "Yellow diamonds in the light". Tiffany & Co has stoked this appetite for yellow diamonds in a variety of modern jewellery using a cushion cut its stonecutters have tailored to maximise their striking colour and inner fire, such as its popular Soleste collection, which uses a double halo of yellow and white diamonds. New York, NY—On October 3, the Natural Color Diamond Association (NCDIA) will host a 2013 conference on brown diamonds at the Diamond Dealer’s Club in New York City. The spectrum of natural brown diamonds is often referred to as common color terms as champagne, cognac, chestnut, latte as well as trademarked names such as Le Vian’s Chocolate Diamonds™, and one of the NCDIA's goals is to help the trade expand selection of color descriptions to make it more friendly and understandable to consumers. These color schemes are an everyday part of the fashion world and lend themselves to perfect jewelry accessories. This upcoming conference will feature presentations by leading scientists, gemologists and designers led by NCDIA’s Director of Education, Thomas Gelb, Wuyi Wang of GIA, Eddie LeVian of LeVian Jewelry and Surbhi Pandya of YNY Jewels. Retailers, manufacturers, designers and press are all encouraged to attend the conference. There will be an extensive exhibit of designer jewelry and unset loose brown family diamonds, including pinkish and reddish, which show the diversity and creative designs they have inspired. There will be plenty of time for networking, meeting new people, enhancing existing relationships, and creating business opportunities. The Brown Diamond Conference is being held on October 3, 2013 from 6:00pm to 9:00pm at the Diamond Dealers Club, located at 580 5th Avenue. Cocktails and light refreshments will be served. There is no cost to attend this event and members and non-members are welcome to attend. The Natural Color Diamond Association (NCDIA)’s mission is to educate and promote global awareness and desire for natural color diamonds. Founded in 2003, NCDIA is a non-profit, membership-based organization that includes some of the world's most renowned rough diamond producers, diamond and jewelry manufacturers, designers and retailers. NCDIA is a prominent voice as an authority for natural color diamonds whose goal is to stimulate the market with up-to-date, relevant information, and provide members with opportunities to network, communicate and interact in trading.